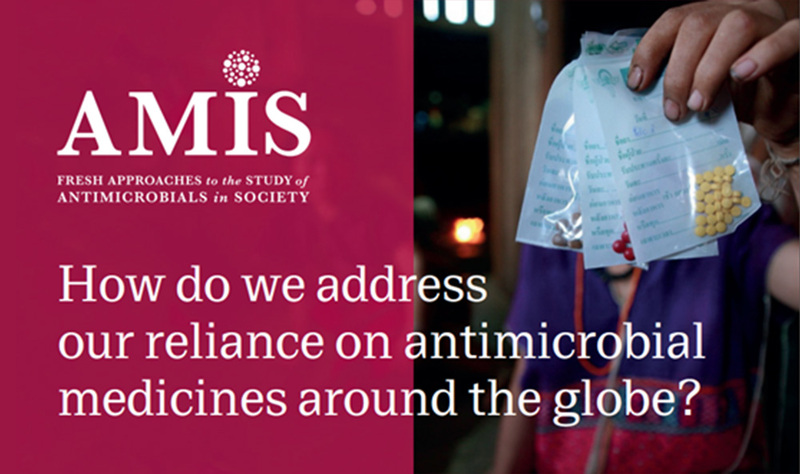 How do we address our reliance on antimicrobial medicines around the globe? Antimicrobial resistance (AMR) is a potentially catastrophic global problem. Drivers and solutions to this problem are often recognised as social. High quality, timely and policy relevant social research is needed to explicate this. 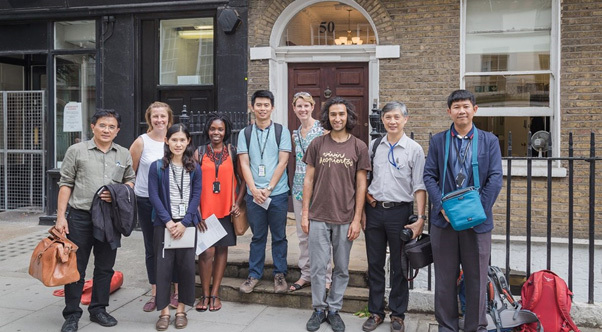 Development of a critical mass of researchers applying fresh perspectives to the topic of antimicrobials in society, through cross-disciplinary networking, training and mentorship. Implementation and support for empirical research with a focus on partnerships, fieldwork, and theoretical development. Dissemination of findings through academic, policy and public engagement. The AMIS Hub proposes the development of fresh approaches to the topic of antimicrobials in society. These will expand the lens of study beyond the traditionally delineated domains of social, biological or clinical into newly configured analytical territory of human-microbial-chemical relations. They will re-cast questions of ‘behaviour’ as questions of infrastructural relations. They will open up spaces inhabited by other disciplines to allow for an expansion of what is seen as relevant to the roles of antimicrobials in society. 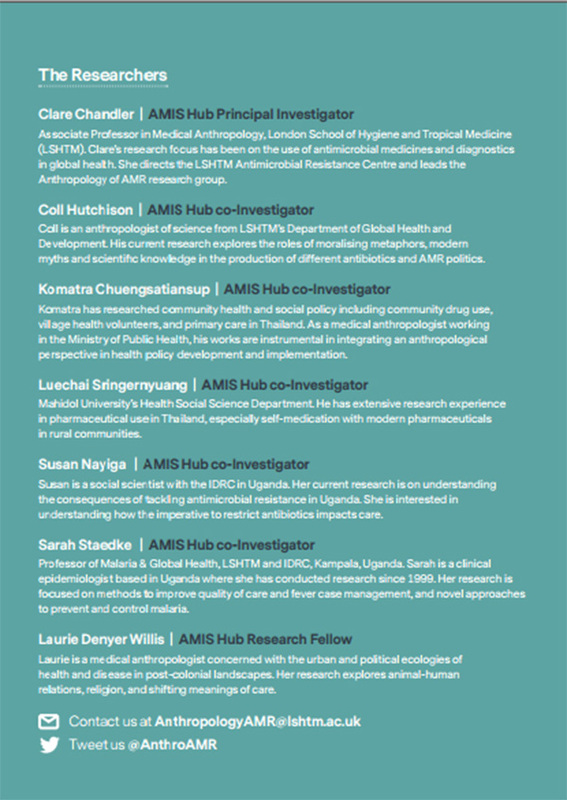 Through a variety of activities, engagements and research encounters, the AMIS Hub therefore aims to provide new ways in which to consider the problem of and potential solutions to antimicrobial resistance. The AMIS Hub will provide a supporting framework for research development, capacity development and dissemination on this topic. Operating as a platform for any researchers or stakeholders interested in this topic, the Hub also directly funds two projects that will exemplify this work, in Uganda and Thailand. Each country team comprises social scientists with strong track records in the study of antimicrobials and policy-oriented research. The studies present a unique academic opportunity for in-depth comparative analysis and theoretical development in the social study of antimicrobials and AMR. As a whole, the Hub presents a exceptional opportunity for impactful engagement at the research-policy interface on a topic of global urgency. The AMIS Hub is funded by the Antimicrobial Resistance Cross Council Initiative which is supported by the seven research councils of the UK in partnership with other funders. The grant is awarded under Theme 4 of this imitative, ‘Tackling Antimicrobial Resistance: behaviour within and beyond the healthcare setting’, awarded by the Economic and Social Research Council (UK) working in partnership with the Department of Health and the Arts and Humanities Research Council (AHRC).